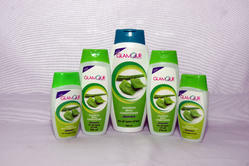 Manufacturer of a wide range of products which include aloevera shampoo, glamour shikakai -reetha shampoo, glamour amla heena shampoo, glamour neem tulsi shampoo, glamour almond- protein shampoo and glamour coconut -milk shampoo. Being a client oriented firm, we are affianced in offering Massage Cream to our patrons. In addition, our offered cream is available in numerous packaging options at reasonable price.